Not a member of Sweeva? Join here. 1. Read the FAQ – Sweeva is a unique program combining the elements of social networking and free traffic exchange programs. The more you understand how the system works the easier it will be for you to take advantage of all the features it has to offer. 2. Update Your Profile – Sweeva is a social site. That means that other members are going to be just as interested in who you are as they are about what you are promoting. Keep your profile updated and don’t forget to upload your photo to Gravatar. 3. Organize Your Websites – Every page you submit to Sweeva will be visible on your profile. Even if you don’t plan to spend any credits promoting a page it’s a good idea to have a list of your sites that can be viewed by other members. Tip: Add your sites with the Sweeva toolbar to earn toolbar loyalty points. 4. Add Quality Feedback – Sweeva gives you the ability to receive instant feedback on any pages that you are promoting. By leaving quality comments on other people’s sites you are not only earning experience points for yourself but you are also helping to get yourself recognized as a valuable member of the Sweeva community. 5. Add Profile Comments – Check out some of the profiles of other members and post a personal message on their page. Ask them about their sites or just introduce yourself. Obviously don’t spam them with your offers but take advantage of this opportunity to network with other members. 6. Support Your Downline – If you refer a new member to Sweeva post a message on their profile to welcome them. Let them know that you are available to help them if they need it. Remember, the more active your Sweeva referrals are the greater your rewards. 7. Strike While the Iron is Hot – Regardless of how many credits you bid your site will only be seen by however many people are surfing at the time it is shown. The number of people surfing varies throughout the day but you can get a good idea of when Sweeva is most active by looking at the daily stats. You can also see how many people are currently online by looking at the “Previous Site” numbers at the bottom of the members area. Wait until there is a good sized crowd of people surfing before you show your site to maximize your page’s exposure. Tip: Activity tends to go way up right after the owners send out an email update. 8. Conserve Your Credits – If you plan on surfing Sweeva for awhile try adjusting your bids to see how low you can go. It usually takes about 10 minutes to find out if your bid has been accepted. 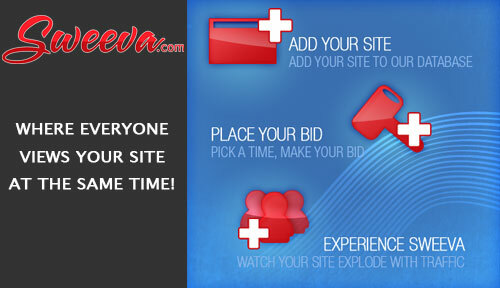 Don’t overbid unless you really want to get your site seen now. 9. Engage Your Guests – My favorite way to use Sweeva is to be present when my site is being shown. This lets me personally welcome people to my page and let them know that I am there if they have any questions. Be social. Thank people if they say something nice. Give out stars. Have fun with it and reap the rewards. 10. Clean Your Comments – This might seem controversial but I delete unwanted comments from my pages before they are shown. Negative comments are fine because it gives me a chance to interact with people but I would rather people only see the quality comments on my page. A page full of people posting “ok” and “good” does nothing to benefit you. It’s no different than tidying up your home before you invite over company. Delete the junk from your comments to make sure the important comments can be seen. 11. Upgrade Your Membership – If you can afford it the upgraded Sweeva membership is one of the best deals around. Not only will you earn greater commissions from your downline but you will also earn credits and XP faster than free members. 12. Be Creative – Sweeva is your social networking community. You can make it into whatever you want it to be. Think of new ways to interact with other members. Try out a new splash page. Record a video. Have a contest. Be social. It’s your Sweeva. Have fun with it! What do you think? Got any other suggestions? Post them in the comments below. Ok, it’s starting to bug me a little bit that I update these lists every week and 9 out of 10 of the new sites are junk. It becomes pretty obvious when you see a new giveaway launched every 2 weeks using the same domain. I think I am just going to start focusing on the best ones. So, here is the list of JV giveaway events for July 26, 2010. It’s getting near the end of the month and I just realized I have only written one review of the new safelists I tested last month. So, i’m going to do a nice quick and easy review today of Reactive Adz. Reactive Adz really isn’t a new safelist. I actually joined when it launched about 2 years ago (I think) because I won a free 1-month upgraded membership. I tested the site then but it was still very new and didn’t have a very large membership so the results weren’t great. I let my upgraded membership expire and I had not logged into the site again until last month. I decided to give it another shot and see if it had improved since my previous experience. Reactive Adz is owned and operated by David Foley who runs a very successful traffic exchange called Traffic Taxis. One of the interesting things about the Reactive Adz homepage is that there is absolutely no mention of the word “safelist”. I know safelists might be considered outdated in some circles which could be why they choose to distance themselves from the word but rest assured Reactive Adz is indeed a credits based safelist. In fact, it is run on the exact same script as some of the most popular credit safelists. So while the ad copy may promote list building you should know that you are only going to build a list with Reactive Adz if you are promoting your own lead capture page with your own autoresponder. I think one of the things that really sets Reactive Adz apart from other safelists is the design of the site. Reactive Adz is literally oozing with style as the “radioactive” theme can be found everywhere on the site. This has nothing to do with how responsive the site is but it sure makes it more fun to login there every day and it should make getting referrals easier when they get a look at the design. Speaking of referrals, Reactive Adz offers some great upgrade offers and generous commissions from your downline. I even snatched up a lifetime upgrade offer which I am sure made whoever my sponsor is very happy. If you hate seeing upgrade offers then Reactive Adz might not be great for you but there is definitely no shortage of ways to make money from your referrals. One other really good thing about Reactive Adz is that they keep the number of emails in your inbox to a minimum. I think I average about 30 emails a day. I also find it difficult to stockpile credits. Even as an upgraded member those daily credit emails become very valuable if you want to be able to email the entire list every day. This usually results in a very responsive safelist since more members are actively opening their emails every day. Ok, so what about the stats? “Actions” represents the number of people who clicked the link on my splash page to go to my main site. 119 seems like a really high number of clicks to receive only 4 sign-ups. I’m pretty sure my site converts better than that but… the numbers don’t lie. This seems like pretty mixed results to me. On one hand Reactive Adz is bringing a lot of very active people to my site but unfortunately not many of them are actually signing up. This is something I am going to have to keep my eye on. It’s possible I just need to find a better offer that interests these people however it’s surprising that my ads that work great on other safelists are not yet doing it for me here. So overall.. mixed results. I’ll definitely keep using Reactive Adz as part of my daily safelist routine and hopefully my number of sign-ups will start to increase soon. I’ll keep you posted. Here is the list of upcoming JV giveaway events for July 19, 2010. And yet most people still struggle to make any real money online. You probably already know how to get the traffic. If you’re using traffic exchanges you can easily generate a few thousand hits to your sites every day with very little effort. The problem is the conversion. Most people can’t figure out how to turn their traffic into cash. They waste all of their time mindlessly clicking away and end up earning little or no money for their trouble. What you need is a system that can convert your traffic into cash which is easy to setup and can generate long-term residual income. One of the only online systems I have been able to find which can do this is called “TE Profits“. I have been a member of TE Profits for at least two years. If you have surfed at any of the major traffic exchanges in the last few years you’ve probably seen their splash pages.. many of them include a picture of the owner Scott Douglas (aka “The Dragonfly”). I admit haven’t promoted TE Profits much because although I think the system is brilliant, the website I guess was just a little bit too confusing for new members which I think made it harder for them to see the forest though the trees. About a week ago Scott Douglas contacted me and showed me the “new” TE Profits website that he has been working on. The new TE Profits website is now so much easier to use. Anybody can sign-up for this system and start putting Scott’s proven money making system to work for them today. Scott just gave me the “thumbs up” that the new site is now open and ready for sign-ups! You will probably see me promoting this a lot more in the future. I am a big fan of both Scott Douglas and TE Profits so I have no problem with recommending him or his program to anyone looking for ways to make money online. Here is the list of upcoming JV giveaway events for July 12, 2010. What if somebody made a list of web pages that display the Sweeva widget? We would then have a list of sites that we could visit every day looking for “prize” widgets and the owners of those sites would benefit from the extra traffic as well as winning half of the prizes. When you visit each of these sites look for the Sweeva widget. If it says you won a prize click it to claim your reward. Want to see your page listed above? Submit the URL of the page showing your Sweeva widget in the comments section below. Just in case you don’t know, Sweeva is a brand new social marketing website that allows members to interact with each other while looking other member’s websites. The Sweeva widget is a little piece of javascipt that you can add to your website which either shows the current site being displayed on Sweeva or it displays your own personal Sweeva stats. Don’t bother clicking it. That’s just an example. Click the list of sites above to locate the real Sweeva prize widgets. Also, don’t forget to check the widget on the right side of this page. Have fun and leave your widget sites in the comments below! As I mentioned a few days ago I want to start doing more reviews of individual safelists, viral list builders, and whatever other programs I have been using lately. The first site I want to review is “A State of the Art Mailing System“. State of the Art Mailer is a relatively new safelist created by Jay Pause and Brad Webb which launched a few months ago. A State of the Art Mailer System appears to be using a unique mailer script. I would say it’s more of a safelist than a viral list builder but there are number of unique features that makes State of the Art Mailer stand out from other sites. One of the things you will notice is that when you join you are first asked to look at 5 websites belonging to other members before continuing. I guess this is the “viral” aspect of the program because when you refer people your ad gets displayed in the 2nd position for your downline members to view and when they refer people your ad appears in the 3rd position. Upgraded members can also have their ads randomly displayed in the other positions. This is supposed to generate hands free traffic to your pages. I’ve never been crazy about these kinds of systems but whatever. I have referred 2 people and my pages have so far gotten 8 hits. You only have to do this when you first join. Otherwise you get presented with a login offer from Jay and Brad along with an advertiser’s full-page ad. You can earn credits if you view the full-page ad for 20 seconds or you can skip it and go right into the site. The members area first appears a little confusing with 20 different menu options being presented to you. The most important items are right at the start though with “Mail Now” being the very first. So what makes State of the Art Mailer special? Basically when you start out as a free member you can email 500 members every 7 days. However if you are active and read enough credit emails from other members you can get bumped up to higher level buttons which let you reach more members. You can also upgrade your membership which gives you automatic access to the higher buttons as well as the ability to email every 3 days instead of 7. I purchased the 5000 button upgrade when I joined and so far have had no trouble reaching the 7500 button which allows me to email almost the entire membership every 3 days. It’s been about 2 months since I joined and so far the results have been excellent. They even post live mailing stats in the members area so that you can see exactly how well the system is working. According to my own personal stats from last month I received 3,430 visitors to my splash pages which resulted in 13 new sign-ups to my program. That’s a pretty decent conversion rate but the fact that a site this new is producing numbers like this is very impressive. There’s a bunch of other unique features such as the “profit sharing pool” for active members (I earned a whopping $2.09 last month) as well as an “instant recruiting” system which apparently is still being worked on and hasn’t been added to the site yet. Overall I am very impressed with the State of the Art Mailer. The site isn’t real pretty but the results are what counts. I think Jay and Brad have created something really unique here and I am looking forward to what they have planned for the future. To join A State of the Art Mailing System for free click the image below. I usually avoid promoting individual giveaway events and prefer to just post weekly updates here on my blog. However, every so often an event comes along that deserves a special mention. This one is called “Internet Marketing JV Gifts” and it’s being run by UK marketer Anthony Tilley who has managed to get a few really big names involved to ensure this is going to be the biggest event of the summer. With this event you will be able to build a huge list of subscribers in a short amount of time, not to mention some really sweet commissions you can earn from promoting the event. I was hanging out in Traffic Exchange Live today where Jon Olson gave us an overview of the new prize widgets that went live at Sweeva today. Starting today the Sweeva widget will randomly start giving away prizes! Instead of the usual content it will display a “Hidden Bonus” message and if you click it you will win the prize. What’s cool is that not only does the person clicking the widget win a prize but the prize is split with the person displaying the widget. This makes for a fun “easter egg hunt” that will hopefully get people looking at your page. I know a bunch of us spent some time today visiting each other’s websites looking for prizes. I have the Sweeva widget installed here on my blog. If you win a prize please post a comment below. Refreshing the page won’t help but make sure you check the Sweeva widget everytime you visit my blog. You never know when you will be the next winner.